The COMT and DBH genes are physically located at chromosomes 22q11 and 9q34, respectively, and both COMT and DBH are involved in catecholamine metabolism and are strong candidates for certain psychiatric and neurological disorders. Although the genetic determinants for both enzymes' activities have been widely studied, their genetic involvement on gene mRNA expression levels remains unclear. In this study we performed quantitative linkage analysis of COMT and DBH cDNA expression levels, identifying transcriptional regulatory regions for both genes. Multiple Haseman-Elston regression was used to detect both additive and interactive effects between two loci. We found that the master transcriptional regulatory region 20q13 had an additive effect on the COMT expression level. We also found that chromosome 19p13 showed both additive and interactive effects with 9q34 on DBH expression level. Furthermore, a potential interaction between COMT and DBH was indicated. Catechol-O-methyltransferase (COMT) (MIM 116790) catalyzes the transfer of a methyl group from S-adenosyl-methionine to catecholamines , and dopamine-beta-hydroxylase (DBH) (MIM 223360) catalyzes the conversion of dopamine to norepinephrine ; both enzymes are involved in the catecholamine metabolism system, in which abnormalities are hypothesized to be related to the development of psychiatric and neurological disorders such as schizophrenia and depression (for reviews, see [3, 4]). There are two distinct forms of COMT, a membrane-bound COMT (MB-COMT) and a soluble COMT (S-COMT) found in the cell cytoplasm ; the former is predominantly expressed in brain neurons, whereas the latter is predominantly expressed in other tissues such as liver and kidney. DBH is expressed in the vesicles of central noradrenergic and adrenergic neurons, peripheral noradrenergic neurons, and adrenomedullary neuronsecreotry cells . 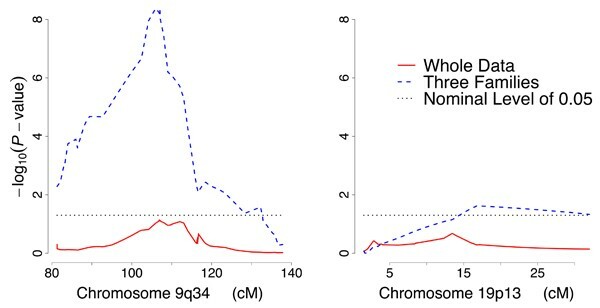 The COMT and DBH genes are physically located at chromosomes 22q11 and 9q34, respectively [7, 8]. There has been intensive research on the genetic determinants of plasma COMT and DBH activities, and findings so far strongly suggest that the structural genes COMT and DBH encoding these proteins are the major quantitative trait loci for their respective plasma activities; moreover, in both genes single-nucleotide polymorphisms (SNPs) have been identified that may account for most of the variation in the enzyme activity levels. On the common functional SNP rs165688, a G→A substitution in exon 4 of COMT produces a valine→methionine (Val/Met) substitution at codons 158 and 108 in the MB-COMT and S-COMT transcripts, respectively. This polymorphism has been shown to have a functional effect on enzyme activity; in particular, Val is a predominant factor that determines higher COMT activity . The SNP rs1611115 (-1021C→T) located in the 5' flanking region of the DBH gene accounts for 35% to 52% of the variance in plasma DBH activity in populations from diverse geographic origins . Though the major effects of these common variants on enzyme activities have been replicated in independent samples, their effects on gene mRNA expression levels remain unclear. The effect of SNP rs165688 on COMT mRNA expression level has been controversial. Bray et al. showed that it altered the COMT mRNA expression level; in contrast, several other studies failed to detect this association between COMT genotypes and expression level (for examples, see ). So far, studies on the determinants of COMT expression level have been limited to seeking cis-acting regulators, including SNP rs165688 and several other SNPs within COMT. To our knowledge, there is as yet no literature documenting effects of SNPs on DBH mRNA expression levels. Phenotypic variation in the transcript level represents an intermediate stage between DNA sequence differences and the clinical expression of complex traits, and there have been studies suggesting a genetic contribution to the variation in gene expression level [13–15]. In the current study, we performed quantitative linkage analysis for both COMT and DBH expression phenotypes, identifying transcriptional regulatory regions for both genes. For COMT, we first identified cis-acting influences on the gene expression level, and then we performed a genome-wide linkage scan for trans-acting regulators across the genome conditional on the cis-acting effect at chromosome 22q11. For DBH, we similarly first identified the cis-acting influences on the gene expression level, and then, both conditional and unconditional on the cis-acting effect at chromosome 9q34, performed a linkage scan for trans-acting regulators specifically on chromosome 19, based on the evidence from previous linkage studies [16–18] that there might be a second locus near chromosome 19p13 acting jointly with DBH at chromosome 9q34 to influence DBH plasma activity. where γ denotes variance (again, attenuated by recombination) due to the genetic interaction between locus 1 and locus 0, and a value significantly different from zero indicates an interactive effect of the two loci on gene expression level. Single-point IBD sharing was estimated by the program GENIBD. Both of the above programs are included in the Statistical Analysis for Genetic Epidemiology (S.A.G.E.) software . We detected a linkage signal at chromosome 22q11 (p = 6.5 × 10-3). The closest SNP to the peak of the signal is rs738842, which is ~3 megabases (Mb) centrometric to the COMT gene and within the cis-acting region defined by Morley et al. . There were 10 regions showing only additive trans-acting effects (Table 1) and 7 regions showing only interactive trans-acting effects (Table 2) at the nominal significance level of 0.005; at 14 other regions, both effects attained a nominal significance level of 0.05 and at least one attained the level 0.005 (Table 3). These nominal significance levels were arbitrarily chosen in order to report the most notable results. Note that 1) chromosome 9q34, where DBH is located, showed an additive trans-acting effect with 22q11 on COMT expression level; and 2) chromosome 20q13, which was one of the two hot spots of transcriptional regulation detected by Morley et al. , was also detected to have an additive effect with 22q11 on the COMT expression level. aBoth effects attained a nominal significance level of 0.05 and at least one reached the level 0.005. There was no linkage signal for the DBH expression level at either chromosome 9q34 or chromosome 19p13 when analyzing all of the 14 pedigrees together. There could be many reasons for the lack of any linkage signal at chromosome 9q34, the structural gene location (see Discussion). However, upon analyzing the pedigrees individually, it was noticed that three pedigrees (1340, 1345 and 1318), which included 70 full sibling pairs, showed a positive linkage signal at 9q34. Because our primary interest was to test whether there is a second locus near chromosome 19p13 related to DBH, in addition to the DBH gene, we selected these three pedigrees for further study and found that a linkage signal at 19p13 then also emerged, showing both additive and interactive trans-acting effects (p = 2.4 × 10-2 and p = 2.6 × 10-2, respectively) with the locus at chromosome 9q34 on DBH expression level (Fig. 1). Linkage signals of DBH expression levels at chromosomes 9q34 and 19p13. Phenotypic variation in the transcript level of a gene involves genetic components; however, the transcriptional regulatory elements may or may not lie in the structural gene itself. Studies by Morley et al. have suggested the existence of master regulatory regions, and we identified chromosome 20q13, nominated by them, as regulating COMT expression level. Note that Morley et al. performed simple HE regression, while we performed multiple HE regression so as to condition on the IBD sharing at COMT, i.e., our analysis refined their original investigation and provided further evidence supporting chromosome 20q13 as a regulatory region. In the current data, overall there was a linkage signal at 22q11 for COMT expression level, but no signal at 9q34 for DBH expression level. Lack of an overall linkage signal at 9q34 for DBH could be due to there not being enough DBH polymorphism segregation in the sample, to there being less expression variation among individuals than between replicates within an individuals , from low levels of transcript abundance in view of its tissue-specific expression pattern (Dr. Joseph F. Cubells, personal communication), or to genetic heterogeneity, as also indicated in the earlier study of plasma DBH activity . In this study we employed multiple HE regression to detect additive and interactive effects between two loci. In the three pedigrees selected for having a positive linkage signal at 9q34 for DBH expression level, we detected a boost of signal at chromosome 19p13, where previous studies [16–18] indicated the existence of a locus influencing DBH plasma activity. The multiple HE regression indicated both additive and interactive effects of the two loci, suggesting epistasis between them. For simplicity, and because of the limited amount of data available, we did not dissect the total genetic variance into additive and dominance components in this study; with more data the interaction could be characterized by more elaborate models , and even embedded in a general pedigree framework [25, 26]. We also noticed that chromosome 9q34, where DBH is located, showed an additive trans-acting effect with 22q11 on COMT expression level. This is not totally unexpected because both enzymes are involved in catecholamine metabolism; however, we could not find in the literature any genetic study on the interaction between them, which is surprising. Interaction between COMT and DBH could be a potential research topic. In summary, we performed quantitative linkage analysis for both COMT and DBH expression phenotypes, identifying transcriptional regulatory regions for both genes. Multiple HE regression was used to detect additive and interactive effects between two loci. The master transcriptional regulatory region 20q13 had an additive effect on the COMT expression level. Chromosome regions 9q34 and 19p13 acted epistatically on DBH expression level. Potential interaction between COMT and DBH was indicated. Some of the results in this paper were obtained by using the program package S.A.G.E., which is supported by a U.S. Public Health Service Resource Grant (RR03655) from the National Center for Research Resources. This work was supported in part by research grants GM-28356 from the National Institute of General Medical Sciences, Cancer Center Support Grant P30CAD43703 from the National Cancer Institute, and a Training grant (HL07567) from the National Heart, Lung and Blood Institute. CX was supported by a Merck Foundation fellowship. CX and QL were sponsored to attend GAW15 by the Endowment Sponsored Mentorship Program of Case Western Reserve University Graduate School.